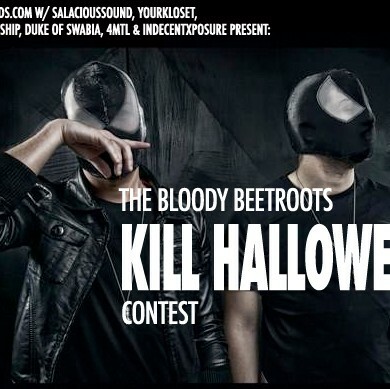 On October 31st Saintwoods.com is throwing Canada’s most evil party KILL HALLOWEEN with the BLOODY BEETROOTS in Montreal. In the run-up to this apocalyptic freakfest Saintwoods.com has teamed up with Salacious Sound and a few other music blogs – Le Mothership, Indecent Xposure, YourKloset and Duke of Swabia – to give away two tickets to the show in Montreal. 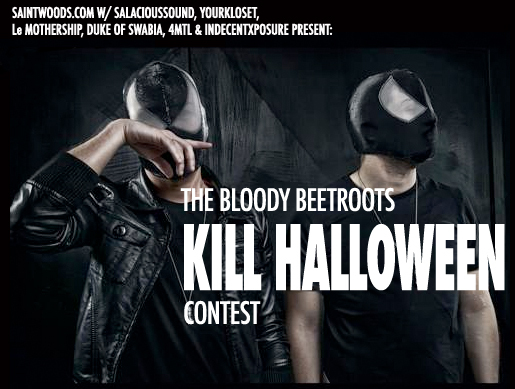 The lucky winner will also receive a free vinyl copy of the Beetroots new album Romborama signed by the masked villains themselves! What was the name of Bob Rifo’s old punk band? On a musical note I have attached this remix of Adam Sky and Zoo Brazil as it is probably my favorite Beetroots track for a while. Loving the drums and slowed down tempo. This track is darker than your average banger and is very well executed. Local Toronto legend, Milano crafted a dark techno journey with an awesome acidic synth line that develops throughout the track and really kicks it up around 3 minutes. Meant for big systems and dark rooms Milano’s mix is made for forgetting about time as the sun rises outside of an abandoned warehouse.